Fallout 76 Perk Cards and the new system for building and levelling up your character. 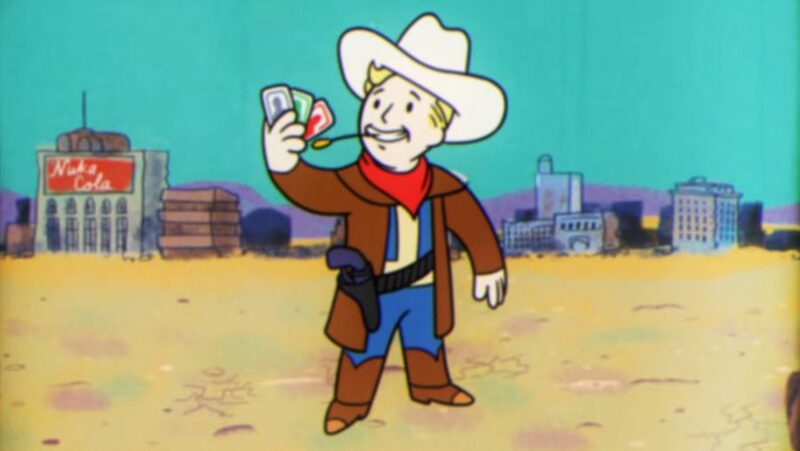 With Fallout 76 breaking new ground for the series, it makes sense that the game will be getting a new S.P.E.C.I.A.L. and Perks systems to suit the online aspect of the upcoming Fallout game – here’s every Fallout 76 Perk Card shown so far and how the levelling mechanic work. Perks and levelling up will work very differently in Fallout 76 compared to previous Fallout games. You will still pick one of the seven S.P.E.C.I.A.L. attributes every time you level up in Fallout 76, but Perks and skills are now tied to Perk Cards. On top of the changes to how Fallout 76 Perks work, there are also substantial changes to what skills each of the S.P.E.C.I.A.L. attributes affect. For example, what use is increased charisma if there are no NPCs around the world to trade, barter with, or speak your way past? 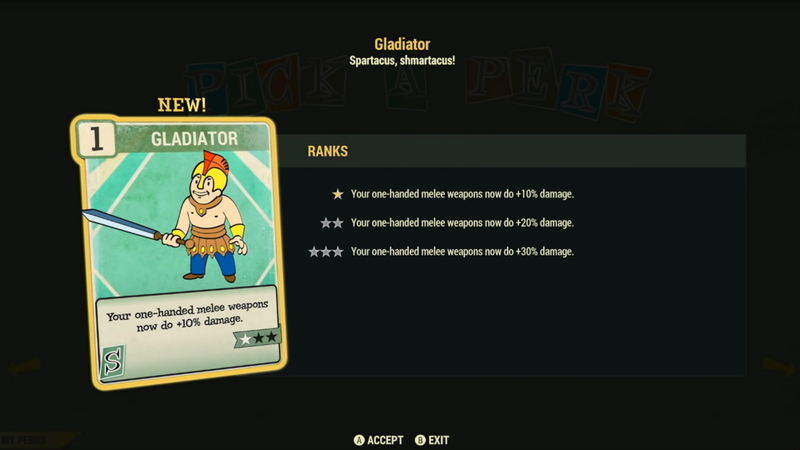 To help prep you all for the impending Reclamation Day we’ve dug through all footage of Fallout 76 Perk Cards so that we can explain how the changes work. A lot of players and Fallout fans have been concerned about how online play will change Fallout 76, so we made this guide to clear up any confusion. 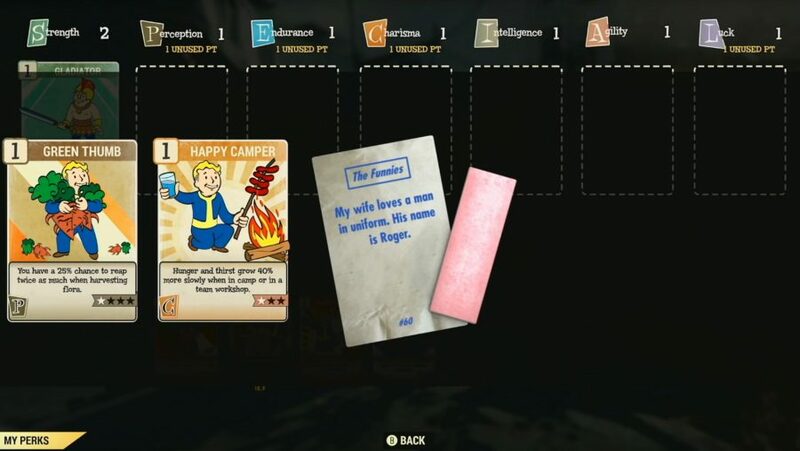 So, how do Fallout 76 Perk Cards work as you level up through the new Fallout game. Every time you level up you will get to put a point towards one of the seven S.P.E.C.I.A.L. attributes, but you will also get to pick a Perk Card to attach to your character all the way up to level 50. You will also be able to unlock Park Card packs that contain four random cards from a list of hundreds, as well as a joke and a stick of gum that temporarily staves off hunger. You’ll get one of these Perk Card packs every two levels up to level ten, and then every five levels up to level 50. 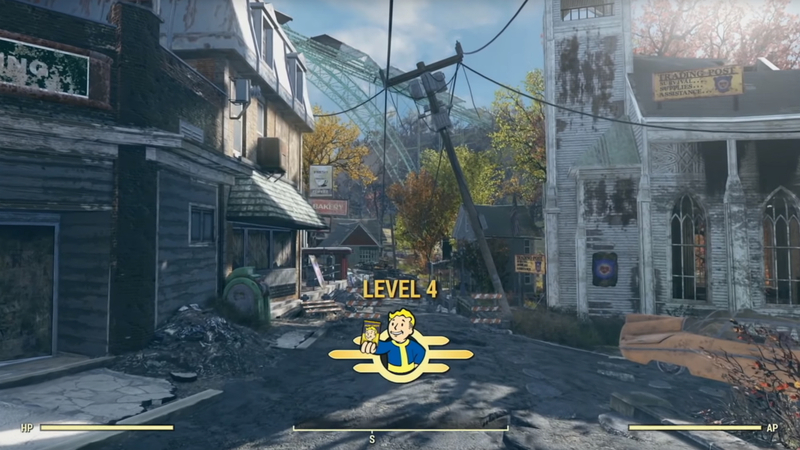 Fallout 76 Perk Cards have levels, too, so if you have an Endurance level of two you will not be able to equip a level three Endurance Perk Card. Effectively, your S.P.E.C.I.A.L. attributes dictate what and how many Perk Cards you can equip. Some Fallout 76 Perk Cards can also be ranked up, which adds to their abilities while increasing their cost. All unlocked cards from Perk Card packs will be saved to a deck so you can swap them in and out of your current character build whenever it suits you. Those Perk Card packs will also contain high level Fallout 76 Perk Cards, giving you future targets to gear your build toward. Finally, in case you were concerned about getting duplicate Perk Cards, you can rank up cards by combining low-level cards, so duplicates aren’t necessarily a bad thing. Rank 1: Ballistic weapon ammo weighs 45% less. Rank 1: Every point of Strength adds +2 Damage Resist (Max 40). Rank 2: Every point of Strength adds +3 Damage Resist (Max 60). Rank 3: Every point of Strength adds +4 Damage Resist (Max 80). Rank 1: Gun bashing does +25% damages with a 5% chance to cripple your opponent. Rank 2: Gun bashing does +50% damages with a 10% chance to cripple your opponent. Rank 1: Heavy guns weigh 30% less. Rank 2: Heavy guns weigh 60% less. Rank 3: Heavy guns weigh 90% less. Rank 1: Take 15% less damage from your opponents’ melee attacks. Rank 2: Take 30% less damage from your opponents’ melee attacks. Rank 3: Take 45% less damage from your opponents’ melee attacks. Rank 1: Gain +20 damage resistance while firing a heavy gun. Rank 2: Gain +40 damage resistance while firing a heavy gun. Rank 3: Gain +60 damage resistance while firing a heavy gun. Rank 1: Full charge sprinting in Power Armor consumes half as much Fusion Core energy. Rank 1: Full charge sprinting in Power Armor consumes no Fusion Core energy. Rank 1: Your melee weapons ignore 25% of your target’s armor. Rank 2: Your melee weapons ignore 50% of your target’s armor. Rank 3: Your melee weapons ignore 75% of your target’s armor. Rank 1: Your punching attacks do +10% damage. Rank 2: Your punching attacks do +15% damage. Rank 3: Your punching attacks do +20% damage. Rank 1: Heavy guns reload 10% faster. Rank 1: Heavy guns reload 20% faster. Rank 1: Heavy guns reload 30% faster. Rank 1: Your melee weapons weigh 20% less, and you can swing them 10% faster. Rank 2: Your melee weapons weigh 40% less, and you can swing them 20% faster. Rank 3: Your melee weapons weigh 60% less, and you can swing them 30% faster. Rank 1: Explosives weigh 30% less. Rank 2: Explosives weigh 60% less. Rank 3: Explosives weigh 90% less. Rank 1: The weight of all junk items is reduced by 25%. Rank 1: Damage and stagger enemies by sprinting into them with Power Armor. Rank 2: Deal more damage by sprinting into enemies with Power Armor. Rank 3: Deal even more damage by sprinting into enemies with Power Armor. Rank 1: Shotguns now weigh 30% less and you reload them 10% faster. Rank 2: Shotguns now weigh 60% less and you reload them 20% faster. Rank 3: Shotguns now weigh 90% less and you reload them 30% faster. Rank 1: Your shotguns now do +10% damage. Rank 2: Your shotguns now do +15% damage. Rank 3: Your shotguns now do +20% damage. Rank 1: Your one-handed melee weapons now do +10% damage. Rank 2: Your one-handed melee weapons now do +20% damage. Rank 3: Your one-handed melee weapons now do +30% damage. Rank 1: Gain +10 to carry weight. Rank 2: Gain +20 to carry weight. Rank 3: Gain +30 to carry weight. Rank 4: Gain +40 to carry weight. Rank 1: Armor weighs 50% less than normal. Rank 1: Weight of all Chems are reduced by 30%. Rank 2: Weight of all Chems are reduced by 60%. Rank 3: Weight of all Chems are reduced by 90%. Perception affects your awareness of nearby enemies, your ability to detect stealthy movement, and your weapon accuracy in V.A.T.S. Rank 2: You can view a target’s specific damage resistances in V.A.T.S. Rank 2: 60% chance to find extra meat when you “Search” an animal corpse. Rank 3: 80% chance to find extra meat when you “Search” an animal corpse. Rank 1: Basic combat training means automatic rifles do +10% damage. Rank 2: Basic combat training means automatic rifles do +15% damage. Rank 3: Basic combat training means automatic rifles do +20% damage. Rank 1: Every V.A.T.S. attack on the same body part gains 10% accuracy and damage. Rank 2: Every V.A.T.S. attack on the same body part gains 15% accuracy and damage. Rank 3: Every V.A.T.S. attack on the same body part gains 20% accuracy and damage. Rank 1: All pistols now have 10% more range and more accuracy when sighted. Rank 2: All pistols now have 20% more range and even more accuracy when sighted. Rank 3: All pistols now have 30% more range and much better accuracy when sighted. Rank 1: Your attacks ignore 25% armor of any insect. Rank 2: Your attacks ignore 50% armor of any insect. Rank 3: Your attacks ignore 75% armor of any insect. Rank 1: See a throwing arc when tossing thrown weapons, and they fly 15% further. Rank 2: See a throwing arc when tossing thrown weapons, and they fly 30% further. Rank 3: See a throwing arc when tossing thrown weapons, and they fly 50% further. Rank 1: You hear directional audio when in range of a Caps Stash. Rank 1: Deal +20% damage to Glowing Enemies. Rank 2: Deal +40% damage to Glowing Enemies. Rank 3: Deal +60% damage to Glowing Enemies. Rank 1: You have a 25% chance to reap twice as much when harvesting flora. Rank 1: Your explosives detonate with a 50% larger radius. Rank 2: Your explosives detonate with twice the radius. Rank 1: Automatic rifles now reload 10% faster and have better hip fire accuracy. Rank 2: Automatic rifles now reload 20% faster and have even better hip fire accuracy. Rank 3: Automatic rifles now reload 30% faster and have excellent hip fire accuracy. Rank 1: Your rifles have 10% more range and more accuracy when sighted. Rank 2: Your rifles have 20% more range and more accuracy when sighted. Rank 3: Your rifles have 30% more range and more accuracy when sighted. Rank 1: Gain Night Vision while sneaking between 6:00 p.m. and 6:00 a.m.
Rank 1: Gain +1 lockpicking skill, and the lockpicking sweet spot is 10% larger. Rank 2: Gain +2 lockpicking skill, ? Rank 3: Gain +3 lockpicking skill, ? Rank 1: Gain +10 energy resistance. Rank 2: Gain +20 energy resistance. Rank 3: Gain +30 energy resistance. Rank 4: Gain +40 energy resistance. Rank 1: Your non-automatic rifles now do +10% damage. Rank 2: Your non-automatic rifles now do +15% damage. Rank 3: Your non-automatic rifles now do +20% damage. Rank 1: Your shotguns have improved accuracy and spread. Rank 2: Your shotguns have even better accuracy and spread. Rank 3: Your shotguns have excellent accuracy and spread. Rank 1: Gain improved control and hold your breath 25% longer while aiming scopes. Rank 2: Gain improved control and hold your breath 50% longer while aiming scopes. Rank 3: Gain improved control and hold your breath 75% longer while aiming scopes. Rank 1: Your rifles ignore 12% armor and have a 3% chance to stagger. Rank 2: Your rifles ignore 24% armor and have a 6% chance to stagger. Rank 3: Your rifles ignore 36% armor and have a 9% chance to stagger. Endurance is a measure of your overall physical fitness. It affects your total health, the Action Point drain from sprinting, and your resistance to disease. Rank 1: You suffer 20% less from hunger and thirst. Rank 2: You suffer 40% less from hunger and thirst. Rank 3: You suffer 60% less from hunger and thirst. Rank 1: Eating Human, Ghoul, Super Mutant, Scorched, or Mole Miner corpses restores Health and hunger. Rank 2: Eating Human, Ghoul, Super Mutant, Scorched, or Mole Miner corpses restores more Health and hunger. Rank 3: Eating Human, Ghoul, Super Mutant, Scorched, or Mole Miner corpses restores even more Health and hunger. Rank 1: Any chems you take last 30% longer. Rank 2: Any chems you take last 60% longer. Rank 3: Any chems you take last 100% longer. Rank 1: You’re half as likely to get addicted when consuming Chems. Rank 1: Nuka-Cola products are now twice as beneficial. Rank 2: Nuka-Cola products are now three times as beneficial. Rank 1: All drinks quench thirst by an additional 25%. Rank 1: Immediately gain +20 Fire Resistance. Rank 2: Immediately gain +40 Fire Resistance. Rank 3: Immediately gain +60 Fire Resistance. Rank 1: Radiation now regenerates your lost Health. Rank 2: Radiation now regenerates more of you lost Health. Rank 3: Radiation now regenerates even more of your lost Health! Rank 1: Eating dog food is now three times as beneficial. Rank 1: Gain gradual health regeneration while in your camp or workshop. Rank 2: Gain improved health and limb regeneration while in your camp or workshop. Rank 1: Chems generate 50% less thirst. Rank 2: Chems no longer generate thirst. Rank 1: Gain 10 Damage and Energy Resistance while not wearing Power Armor. Rank 2: Gain 20 Damage and Energy Resistance while not wearing Power Armor. Rank 3: Gain 30 Damage and Energy Resistance while not wearing Power Armor. Rank 4: Gain 40 Damage and Energy Resistance while not wearing Power Armor. Rank 5: Gain 50 Damage and Energy Resistance while not wearing Power Armor. Rank 1: Your chance to catch a disease from food is reduced by 30%. Rank 2: Your chance to catch a disease from food is reduced by 60%. Rank 3: Your chance to catch a disease from food is reduced by 90%. Rank 1: You take 30% less radiation from eating or drinking. Rank 2: Gain a total of +15 to your maximum Health. Rank 3: Gain a total of +30 to your maximum Health. Rank 4: Gain a total of +45 to your maximum Health. Rank 1: Using chems induces 50% less hunger. Rank 2: Chems now never induce hunger. Rank 1: You are 30% less likely to catch a disease from the environment. Rank 2: You are 60% less likely to catch a disease from the environment. Rank 3: You are 90% less likely to catch a disease from the environment. Rank 1: Gain +20 to max Health while between the hours of 6 p.m. and 6 a.m.
Rank 2: Gain +40 to max Health while between the hours of 6 p.m. and 6 a.m.
Rank 1: Gain Health regen between the hours of 6 a.m. and 6 p.m.
Rank 2: Gain improved Health regen between the hours of 6 a.m. and 6 p.m.
Rank 1: There’s no chance you’ll get addicted to alcohol. Rank 1: The greater your Rads, the greater your Strength (max +5 STR)! Rank 1: Gain +10 Radiation Resistance. Rank 2: You now have +20 Radiation Resistance. Rank 3: You now have +30 Radiation Resistance. Rank 4: You now have +40 Radiation Resistance. Rank 1: When affected by Rads, you periodically heal 80 Rads on nearby teammates. Rank 2: When affected by Rads, you periodically heal 140 Rads on nearby teammates. Rank 3: When affected by Rads, you periodically heal 200 Rads on nearby teammates. Rank 1: You gain increased benefit from being Well Fed or Well Hydrated. Rank 2: You gain much increased benefit from being Well Fed or Well Hydrated. Rank 2: Gain +50% damage bonus for 2 minutes when a player revives you. Rank 1: All food satisfies hunger by an additional 25%. Rank 1: Gain +1 STR and +1 END between the hours of 6:00 a.m. and 6:00 p.m.
Rank 2: Gain +1 STR and +1 END between the hours of 6:00 a.m. and 6:00 p.m.
Rank 3: Gain +1 STR and +1 END between the hours of 6:00 a.m. and 6:00 p.m.
Rank 1: Slowly regen radiation damage between the hours of 6:00 a.m. and 6:00 p.m.
Rank 2: Quickly regen radiation damage between the hours of 6:00 a.m. and 6:00 p.m.
Rank 1: Drinking any liquid has a 30% reduced chance to cause Disease. Rank 2: Drinking any liquid has a 60% reduced chance to cause Disease. Rank 3: Drinking any liquid has a 90% reduced chance to cause Disease. Charisma is your ability to lead and help others. It allows you to share higher point Perk Cards and also affects your rewards from Group Missions and prices when you barter. Rank 1: Aim your gun at any animal below your level for a 25% chance to pacify it. Rank 2: Aim your gun at any animal below your level for a 50% chance to pacify it. Rank 3: Aim your gun at any animal below your level for a 75% chance to pacify it. Rank 1: Your disease cures have a 50% chance to cure a disease on nearby teammates. Rank 2: Your disease cures always cure a disease from nearby teammates too. Rank 2: Bloodpacks satisfy more thirst, no longer irradiate, and heal 100% more. Rank 3: Bloodpacks greatly satisfy thirst, no longer irradiate, and heal 150% more. Rank 1: Gain 6 Damage and Energy Resist (max 18) for each teammate excluding you. Rank 3: Gain 10 Damage and Energy Resist (max 30) for each teammate excluding you. Rank 4: Gain 12 Damage and Energy Resist (max 36) for each teammate excluding you. Rank 1: Players you revive come back with health regen for 15 seconds. Rank 2: Players you revive come back with improved health regen for 30 seconds. Rank 3: Players you revive come back with high health regen for 60 seconds. Rank 2: Stimpaks and RadAway will now work much more quickly. Rank 1: Teammates hit by your flame weapons regen health briefly (no Molotov). Rank 2: Teammates hit by your flame weapons regen more health briefly (no Molotov). Rank 3: Teammates hit by your flame weapons regen even more health (no Molotov). Rank 1: Hunger and thirst grow 40% more slowly when in camp or in a team workshop. Rank 2: Your luck is increased by 3 while under the influence of alcohol. Rank 1: Buying and selling prices at vendors are better. Rank 2:Buying and selling prices at vendors are even better. Rank 3: Buying and selling prices at vendors are now much better. Rank 1: Players you revive are cured of all Rads. Rank 1: Players you revive have +6 Action Point regen for 10 minutes. Rank 2: Players you revive have +12 Action Point regen for 10 minutes. Rank 3: Players you revive have +18 Action Point regen for 10 minutes. Rank 1: When you are on a team, gain 5% more XP. Rank 3: When adventuring alone, take 15% less damage and gain 20% AP regen. Rank 4: When adventuring alone, take 20% less damage and gain 30% AP regen. Rank 1: Gain 1 Charisma for each teammate, excluding yourself. Rank 2: Gain 2 Charisma for each teammate, excluding yourself. Rank 2: Your maximum Bounty timer is reduced by 20%. Rank 3: Your maximum Bounty timer is reduced by 40%. Rank 4: Your maximum Bounty timer is reduced by 60%. Rank 1: Rads increase your chance to inflict 25 Rads with melee attacks! Rank 2: Rads increase your chance to inflict 50 Rads with melee attacks! Rank 3: The effects of alcohol are tripled. Rank 2: Restore more of your team’s hunger and thirst when you eat or drink. Rank 3: Restore much more of your team’s hunger and thirst when you eat or drink. Rank 2: You regenerate more health for 7 seconds after reviving another player. Rank 3: You regenerate even more health for 10 seconds after reviving another player. Rank 2: Run 20% faster when part of a team. Rank 1: Reduce your target’s damage output by 10% for 2 seconds after you attack. Rank 2: Reduce your target’s damage output by 20% for 2 seconds after you attack. Rank 3: Reduce your target’s damage output by 30% for 2 seconds after you attack. Rank 1: Make your target receive 5% more damage for 5 seconds after you attack. Rank 2: Make your target receive 6% more damage for 7 seconds after you attack. Rank 3: Make your target receive 7% more damage for 10 seconds after you attack. Rank 1: You pay 30% fewer Caps when Fast Travelling. Rank 1: Aim your gun at a creature below your level for a 25% chance to pacify it. Rank 2: Aim your gun at a creature below your level for a 50% chance to pacify it. Rank 3: Aim your gun at a creature below your level for a 75% chance to pacify it. Intelligence is a measure of your overall mental acuity, and affects your ability to hack terminals, the condition and durability of items that you craft, and the return you get from scrapping. Rank 2: Crafting armor now costs fewer materials. Rank 3: Your crafted armor has improved durability. Rank 1: You get double the quantity when you craft chems! Rank 2: Crafting workshop items now costs 50% fewer materials. Rank 1: Your explosives do +20% damage. Rank 2: Your explosives do +40% damage. Rank 3: Your explosives do +60% damage. Rank 4: Your explosives do +80% damage. Rank 5: Your explosives do +100% damage. Rank 1: Stimpaks restore 15% more lost Health. Rank 2: Stimpaks restore 30% more lost Health. Rank 3: Stimpaks restore 45% more lost Health. Rank 1: You can repair armor and Power Armor to 130% of normal maximum condition. Rank 2: You can repair armor and Power Armor to 160% of normal maximum condition. Rank 3: You can repair armor and Power Armor to 200% of normal maximum condition. Rank 2: Workshop items are 60% cheaper to repair. Rank 1: Your pipe weapons break 30% more slowly and are cheaper to repair. Rank 2: Your pipe weapons break 60% more slowly and are cheaper to repair. Rank 3: Your pipe weapons break 90% more slowly and are cheaper to repair. Rank 1: While below 20% Health, gain 20 Damage Resist, 10% damage and 15% AP regen. Rank 2: While below 20% Health, gain 30 Damage Resist, 15% damage and 15% AP regen. Rank 3: While below 20% Health, gain 40 Damage Resist, 20% damage and 15% AP regen. Rank 1: All Power Armor parts and chassis weights are reduced by 25%. Rank 2: All Power Armor parts and chassis weights are reduced by 50%. Rank 3: All Power Armor parts and chassis weights are reduced by 75%. Rank 1: Your Power Armor breaks 20% more slowly and is cheaper to repair. Rank 2: Your Power Armor breaks 40% more slowly and is cheaper to repair. Rank 3: Your Power Armor breaks 60% more slowly and is cheaper to repair. Rank 2: Crafting Power Armor now costs fewer materials. Rank 3: Your crafted Power Armor now has improved durability. Rank 1: Fusion Cores now last 20% longer. Rank 2: Fusion Cores now last 40% longer. Rank 3: Fusion Cores now last 60% longer. Rank 4: Fusion Cores now last 80% longer. Rank 5: Fusion Core duration is now doubled. Rank 1: Hack an enemy robot for a 25% chance to pacify it. Rank 2: Hack an enemy robot for a 50% chance to pacify it. Rank 3: Hack an enemy robot for a 75% chance to pacify it. Rank 2: Crafting energy guns now costs fewer materials. Rank 2: Your crafted energy guns have improved durability. Rank 1: Obtain more components when you scrap weapons and armor. Rank 1: In Power Armor, heavy guns gain more accuracy and ignore 15% armor. Rank 2: In Power Armor, heavy guns gain even more accuracy and ignore 30% armor. Rank 3: In Power Armor, heavy guns gain excellent accuracy and ignore 45% armor. Rank 1: RadAway removes 30% more radiation. Rank 2: RadAway removes 60% more radiation. Rank 3: RadAway removes twice as much radiation. Rank 1: You can repair any weapon to 130% of normal maximum condition. Rank 2: You can repair any weapon to 160% of normal maximum condition. Rank 3: You can repair any weapon to 200% of normal maximum condition. Rank 1: You deal +40% damage to workshop objects. Rank 2: You deal +80% damage to workshop objects. Rank 3: You deal +120% damage to workshop objects. Agility is a measure of your overall finesse and reflexes. It affects the number of Action Points in V.A.T.S. and your ability to sneak. Rank 1: Action Points regenerate 15% faster. Rank 1: Gain +6% (max 36%) damage for 30s per kill. Duration refreshes with kills. Rank 2: Gain +7% (max 42%) damage for 30s per kill. Duration refreshes with kills. Rank 3: Gain +8% (max 48%) damage for 30s per kill. Duration refreshes with kills. Rank 4: Gain +9% (max 54%) damage for 30s per kill. Duration refreshes with kills. Rank 5: Gain +10% (max 60%) damage for 30s per kill. Duration refreshes with kills. Rank 1: Produce 40% more rounds when crafting ammunition. Rank 2: Produce 80% more rounds when crafting ammunition. Rank 1: Falling below 20% health will automatically use a Stimpak, once every 20s. Rank 2: Falling below 30% health will automatically use a Stimpak, once every 20s. Rank 3: Falling below 40% health will automatically use a Stimpak, once every 20s. Rank 1: Your ranged sneak attacks deal 2.15x normal damage. Rank 2: Your ranged sneak attacks deal 2.3x normal damage. Rank 3: Your ranged sneak attacks deal 2.5x normal damage. Rank 1: Sprint 10% faster at increased AP cost when your health is below 40%. Rank 2: Sprint 20% faster at increased AP cost when your health is below 50%. Rank 1: Avoid 10% of incoming damage at the cost of 30 Action Points per hit. Rank 2: Avoid 20% of incoming damage at the cost of 30 Action Points per hit. Rank 3: Avoid 30% of incoming damage at the cost of 30 Action Points per hit. Rank 1: Your shotguns gain a 5% stagger chance and a 10% chance to cripple a limb. Rank 2: Your shotguns gain a 10% stagger chance and a 20% chance to cripple a limb. Rank 3: Your shotguns gain a 15% stagger chance and a 30% chance to cripple a limb. Rank 1: Sneak to lose enemies, and running no longer affects stealth. Rank 1: Your automatic pistols now do +10% damages. Rank 2: Your automatic pistols now do +15% damages. Rank 3: Your automatic pistols now do +20% damages. Rank 1: V.A.T.S. swaps target on kill with +10% damage to your next target. Rank 2: V.A.T.S. swaps target on kill with +10% then 20% damage to your next 2 targets. Rank 3: V.A.T.S. swaps target on kill with +10%, 20% then 30% damage to your next 3 targets. Rank 1: Your running speed is increased by 10% when you have a pistol equipped. Rank 1: Your non-automatic pistols now do +10% damage. Rank 2: Your non-automatic pistols now do +15% damage. Rank 3: Your non-automatic pistols now do +20% damage. Rank 1: While sneaking, you never trigger mines or floor-based traps. Rank 2: Sprinting consumes 30% fewer action points. Rank 3: Sprinting consumes 40% fewer action points. Rank 1: At night your silenced weapons do an additional 25% sneak attack damage. Rank 2: At night your silenced weapons do an additional 50% sneak attack damage. Rank 1: Gain Pistol hip fire accuracy and a 2% chance to cripple a limb. Rank 2: Gain more Pistol hip fire accuracy and a +3% chance to cripple a limb. Rank 3: Gain excellent Pistol hip fire accuracy and a +4% chance to cripple a limb. Rank 1: Sneak attacks with melee weapons do 2.3x normal damage. Rank 2: Sneak attacks with melee weapons do 2.6x normal damage. Rank 3: Sneak attacks with melee weapons do 3x normal damage. Rank 1: Your pistols weigh 25% less. Rank 2: Your pistols weigh 50% less. Rank 3: Your pistols weigh 75% less. Rank 1: Stealth Boys last twice as long ! Rank 2: Stealth Boys last three times as long ! Rank 3: Stealth Boys last four times as long ! Rank 1: You are 25% harder to detect while sneaking. Rank 2: You are 50% harder to detect while sneaking. Rank 3: You are 75% harder to detect while sneaking. Rank 1: Food and drink weights are reduced by 30%. Rank 1: Your armor breaks 30% more slowly and is cheaper to repair. Rank 2: Your armor breaks 60% more slowly and is cheaper to repair. Rank 3: Your armor breaks 90% more slowly and is cheaper to repair. Luck is a measure of your general good fortune, and affects the recharge rate of Critical Hits as well as the condition and durability of items that you loot. Rank 1: V.A.T.S. criticals now do +20% damage. Rank 2: V.A.T.S. criticals now do +30% damage. Rank 3: V.A.T.S. criticals now do +40% damage. Rank 1: 5% bonus damage means enemies may explode into a gory red paste. Rank 2: 10% bonus damage means enemies may explode into a gory red paste. Rank 3: 15% bonus damage means enemies may explode into a gory red paste. Rank 1: 40% chance to find an extra canned food when your “Search” a food container. Rank 1: You have a chance to find more bottle caps when opening a caps stash. Rank 2: You have a better chance to find more caps when opening a caps stash. Rank 3: You always find more bottle caps when opening a caps stash. Rank 1: The negative effects of your mutations are reduced by 25%. Rank 2: The negative effects of your mutations are reduced by 50%. Rank 3: The negative effects of your mutations are reduced by 75%. Rank 1: Critical Hits now only consume 85% of your critical meter. Rank 2: Critical Hits now only consume 70% of your critical meter. Rank 3: Critical Hits now only consume 55% of your critical meter. Rank 1: The benefits of bobbleheads and magazines last twice as long. Rank 1: You have a 50% chance to keep your Stimpak when you revive another player. Rank 1: Each hit in V.A.T.S. has a chance to fill your critical meter. Rank 2: Each hit in V.A.T.S. has a better chance to fill your critical meter. Rank 3: Each hit in V.A.T.S. has an excellent chance to fill your critical meter. Rank 1: Food in your inventory will spoil 30% more slowly. Rank 2: Food in your inventory will spoil 60% more slowly. Rank 3: Food in your inventory will spoil 90% more slowly. Rank 1: Any kill in V.A.T.S. has a 15% chance to restore all Action Points. Rank 2: Any kill in V.A.T.S. has a 25% chance to restore all Action Points. Rank 3: Any kill in V.A.T.S. has a 35% chance to restore all Action Points. Rank 1: You drop a live grenade from your inventory when you die. Rank 1: Slight chance your weapon will repair itself when hitting an enemy. Rank 2: Chance your weapon will repair itself even more when hitting an enemy. Rank 3: Chance your weapon will greatly repair itself when hitting an enemy. Rank 1: Slight chance your equipped armor will repair itself when struck. Rank 2: Chance your equipped armor will repair itself even more when struck. Rank 3: Chance your equipped armor will greatly repair itself when struck. Rank 1: A Mysterious Savior will occasionally appear to revive you when downed. Rank 2: A Mysterious Savior will more frequently appear to revive you when downed. Rank 3: The Mysterious Savior will regularly appear to revive you when downed. Rank 1: The Mysterious Stranger will appear occasionally in V.A.T.S. to lend a hand. Rank 3: The Mysterious Stranger appears so much in V.A.T.S., he knows you by name. Rank 1: Stimpaks may generate edible meat tissue. Higher Rads improve the chance. Rank 2: Stimpaks generate more edible meat tissue. Higher Rads improve the chance. Rank 3: Stimpaks generate excessive, edible meat. Higher Rads improve the chance. Rank 1: Heavy guns gain a 4% stagger chance and a 4% chance to cripple a limb. Rank 2: Heavy guns gain a 8% stagger chance and a 8% chance to cripple a limb. Rank 3: Heavy guns gain a 12% stagger chance and a 12% chance to cripple a limb. Rank 1: 40% chance to find extra first aid Chems when you “Search” a chem container. Rank 1: Every kill in V.A.T.S. has a 5% chance to refill your Critical Meter. Rank 2: Every kill in V.A.T.S. has a 10% chance to refill your Critical Meter. Rank 3: Every kill in V.A.T.S. has a 15% chance to refill your Critical Meter. Rank 1: Gain a 6% chance to instantly reload when your clip is empty. Rank 2: Gain a 12% chance to instantly reload when your clip is empty. ? Rank 3: Gain a 18% chance to instantly reload when your clip is empty. ? Rank 1: 40% chance to find extra ammo when you “Search” an ammo container. Rank 2: While below 30% health, gain 30% chance to avoid damage. Rank 3: While below 30% health, gain 45% chance to avoid damage. Rank 1: Less chance for you to mutate from rads or for Radaway to cure mutations. Rank 1: Gain health regeneration while outside during rain or Rad Storms. Rank 2: Gain high health regeneration while outside during rain or Rad Storms. Rank 1: When you craft anything, there is a 10% chance you’ll get double results! Rank 2: When you craft anything, there is a 20% chance you’ll get double results! Rank 3: When you craft anything, there is a 30% chance you’ll get double results! Rank 1: Your rifle attacks have a 5% chance of crippling a limb. Rank 2: Your rifle attacks have a 10% chance of crippling a limb. Rank 3: Your rifle attacks have a 15% chance of crippling a limb. Rank 1: Collect twice as much when harvesting wood. That’s your lot, all Fallout 76 Perk Cards revealed so far. We know there are many, many more out there, so keep checking back with us for all the latest Perk Card reveals so far. For more information on the next Fallout game, such as the Fallout 76 release date, check out our dedicated guide. In the meantime, there are plenty of Perk Cards to browse through, perhaps even enough to start planning your character build.